I had the pleasure of hearing Glenn at the Toronto Harbourfront Travel Author’s Night and after reading his book, I invited him—and he accepted—to lead one of the workshops at CITC’s Student Conference on November 9th (www.citc.ca/studentconference). 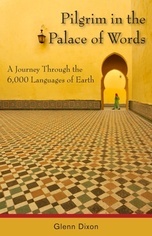 Glenn’s travels to Asia and South America reflected my own interests in discovery and his discussion of language, and the meanings of words added a unique touch to a very well written and often humorous book. With a title like that I just had to buy the book with chapters based on the CBC Massey Lectures. Davis is a great writer (and presumably speaker too) as he talks about the disappearing qualities of community, including language and wisdom passed down from generation to generation. He notes “humanities greatest legacy” as the “ethnosphere” and describes it as ‘the sum total of all thoughts and intuitions, myths and beliefs, ideas and inspirations brought into being by the human imagination since the dawn of consciousness. A very thought-provoking book. I bought this novel the last time I was in Tokyo, mostly because I was captivated by the title. I absorbed the book in one week. Murakami’s character development combines with a plot that is not only mysterious and absorbing but also fascinating to read. As you may gather, I read a lot of Japanese fiction (in English). Mishima is an excellent story teller. Having seen the Golden Pavilion in Kyoto on two separate occasions, I never realized that it is a replica of the original which was constructed over 500 years ago—but burned to the ground in 1950. Mishima pieces together the life of the central character to explain what led him to commit the evil deed. This is a great travel book written by a former Hells Angel, turned Martial Arts Expert, turned traveller. Glenn decides to be the first to travel the world on a motorcycle. His insights into people, culture and society, as well as his descriptions of his travel experiences is excellent. Another one of those ‘can’t put it down’ books that I finished in one week. Now I have the absolute pleasure of spending the Labour Day weekend looking for the next book to escape into, and one of these days, my own book, which I started 20 years ago, may yet be finished.